Hey ACErs! Mark your calendar. Elizabeth Ringas has been working hard on the 2014 calendar and your regional rep. is announcing dates for three events in 2014 with more dates to come! Head out to Central Park Funland on Sunday February 9 for ACE Day at Central Park Funland. Central Park Funland is located in Fredericksburg, VA and has some awesome indoor and outdoor rides (weather permitting) including Jett Star. The Jett Star indoor mini roller coaster measures approximately 70′ long X 30′ wide. With seven (7) cars, the Jett Star can seat up to 14. Riders must be at least 48″ tall to ride alone, or 36″ to ride with supervision (another passenger in the same car at least 48″ tall). Maximum weight per car is 200 lbs. ACE poses for a group photo in front of Joker’s Jinx during Jeepers It’s Winter! in March 2011. On Saturday March 1, 2014, head out to Six Flags America for our Six Flags America off-season event. 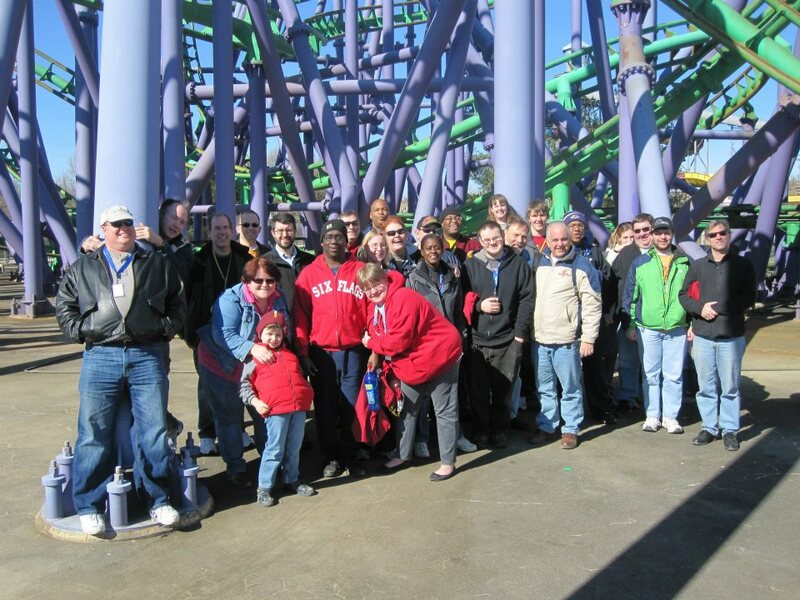 In 2013, Premier Rides gave attendees a presentation and back stage tour of Joker’s Jinx, Six Flags America’s Park President and Directors gave a presentation and over lunch ACErs caught up with their friends after a long off season of fun. In 2014, we are hoping to expand this event, so check back for details. On Sunday March 9, on your way back from Coaster Bash! at Salvatore’s in the ACE Western PA region, make sure your stop at MountainFest at Wisp Resort to ride Maryland’s Mountain Coaster. The Mountain Coaster at Wisp Resort is a gravitational hybrid of an Alpine Slide and a Roller Coaster boasting a 1,300 foot uphill track while twisting, turning, dipping and rolling for 3,500 feet downhill over 350 vertical feet on the eastern side of Wisp Mountain. Guests ride in ‘coaster carts’ that hold up to two riders and regulate their own speed with a set of handbrakes on the side of each cart. A centrifugal braking system restricts the coaster cart’s downhill speed at 26 mph. All of these events are in the planning stages so be sure to check back for more details in the coming weeks and months.